It is important to tell our stories; the stories of where we come from, the stories of our families, and especially stories of the Holocaust. There are lessons to be learned and applied to situations going on right now in the world. We have seen this before. We have lived it. What kind of people are we? and what kind of world do we want for each other? 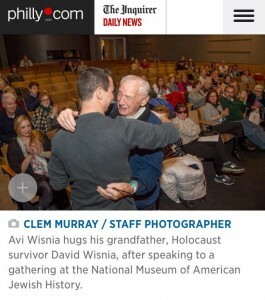 Thanks to everyone who attended the event at the National Museum of American Jewish History in Philadelphia. Read more from an article in the Philly Inquirer. Posted Wednesday, May 4th, 2016 under Uncategorized.